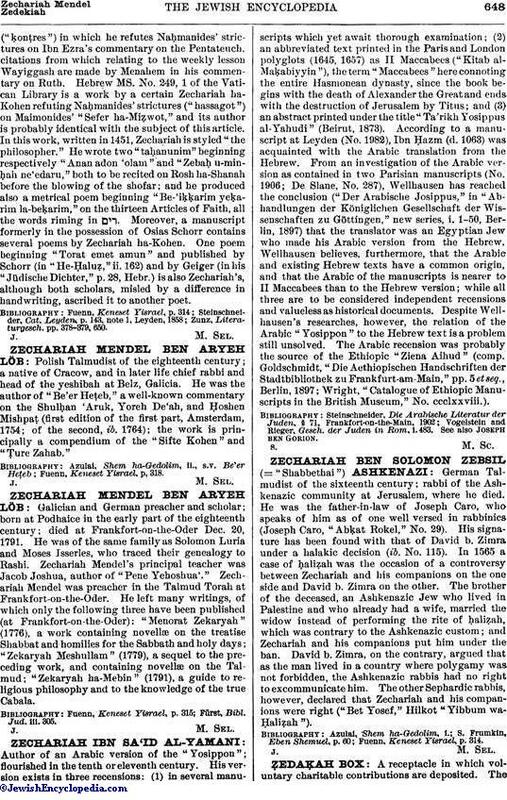 German Talmudist of the sixteenth century; rabbi of the Ashkenazic community at Jerusalem, where he died. He was the father-in-law of Joseph Caro, who speaks of him as of one well versed in rabbinics (Joseph Caro, "Abḳat Rokel," No. 29). His signature has been found with that of David b. Zimra under a halakic decision (ib. No. 115). In 1565 a case of ḥaliẓah was the occasion of a controversy between Zechariah and his companions on the one side and David b. Zimra on the other. The brother of the deceased, an Ashkenazic Jew who lived in Palestine and who already had a wife, married the widow instead of performing the rite of ḥaliẓah, which was contrary to the Ashkenazic custom; and Zechariah and his companions put him under the ban. David b. Zimra, on the contrary, argued that as the man lived in a country where polygamy was not forbidden, the Ashkenazic rabbis had no right to excommunicate him. The other Sephardic rabbis, however, declared that Zechariah and his companions were right ("Bet Yosef," Hilkot "Yibbum waḤaliẓah"). Fuenn, Keneset Yisrael, p. 314.